Due to the increased overhead for using Scratch Live or Ableton Live together with The Bridge, we recommend you do the following optimization techniques for your computer. Close down any other software apart from Scratch Live and Ableton Live (this includes antivirus software or the like). Switch off Bluetooth, wireless network and unplug any wired network connections. Switch off screen saver and set sleep mode and hard drive sleep to 'never'. Disable any Software Updates or scheduled tasks. Always plug your Rane hardware directly into the computer’s USB port, not a hub. Go to your laptop manufacturer's website to check if there any driver updates for your machine. Check that you are using a ‘good’ USB port. If you are using a Macbook Pro, this can be the left port or for models with two USB ports on the left and Macbooks this will be the port furthest away from the screen. Try all ports until you get the best results. Ensure you have ample room left on your hard drive (this is approx 10% of your hard - both internal and external). Using two audio software programs at once will increase the load on your computers processor (CPU) more than either program alone. It is therefore very important to reduce CPU usage in any way possible, and it is worth monitoring CPU usage to see when your computer starts to get audio dropouts/glitches and make sure you keep the usage below this level. Ableton Live offers a CPU load indicator, however it is worth checking your operating system's CPU views to get a more precise look at your computer's overall processing load. 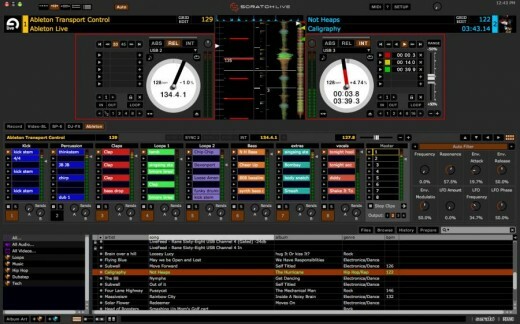 To lower CPU use from Scratch Live try disabling any unused functions or plugins (such as DJ-FX, SP-6, AUX Deck, etc). Remove any unwanted audio clips or VSTs if don't plan to use them in the session. Ableton Live offers different modes for warping audio tracks, each offering different benefits. The warp modes Complex and Complex Pro both place a much higher strain on your CPU, requiring around 10 times the amount of CPU resources compared to other modes. If your system is struggling, or you find that your audio quality is lower than expected using these modes, you may wish to change the warp modes for some, or all of your audio clips in Ableton Live. Both Scratch Live and Ableton Live offer the ability to adjust audio latency to get trouble free audio playback. You may need to adjust one or both of these to get a good balance. Increasing the latency in either program will reduce the load on your computer's CPU and free up more of your computer's system resources. 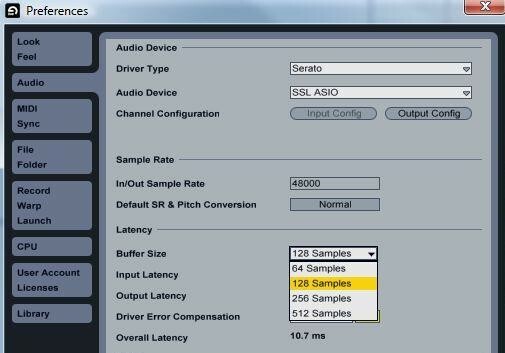 Try adjusting your USB buffer latency in the Scratch Live Setup screen. The lower the latency the more system resources will be used. Try adjusting this to a higher value to lighten your processor load. If you are requiring a low latency in Scratch Live for DJ techniques such as scratching and you are experiencing issues, then you may want to keep Scratch Live latency low and increase the buffer in Ableton Live. Increasing the USB buffer in Ableton Live increases the time between changing a controller device and the application responding.